Lucinda Scala Quinn is Executive Food Director, Martha Stewart Living Omnimedia, a co-host of "Everyday Food" on PBS and has her own show EatDrink on Martha Stewart Living Radio on SIRIUS channel 112 and XM Radio 157. She appears regularly on CBS' "Early Show," NBC's "Today Show" and the Emmy-winning daily, nationally syndicated television series, "The Martha Stewart Show," and is the author of two cookbooks — the third book forthcoming, Mad Hungry: Feeding Men and Boys, Artisan, October 2009. 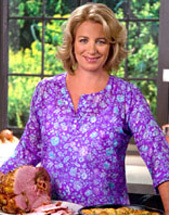 Lucinda started cooking professionally as a teenager, and has worked as a chef, cooking teacher, caterer and food writer. She lives with her husband and three boys in New York City.